In the mid-19th-century a village of Goathland didn’t exist, just a handful of isolated farms separated by wide tracts of common land providing routes between farms and the surrounding moorland. The Duchy of Lancaster claim ownership of this common land and until a few years ago allowed residents the right to cross it in order to access their properties for a nominal rent. In 2013 animosity developed when the Duchy decided to charge a more commercial rent resulting in the residents being faced with bills of thousands of pounds. The revenue from the Duchy of Lancaster estates will, of course, be enjoyed by Her Majesty the Queen. The coming of the railway and its reputation as a Victorian health spa led to Goathland’s rapid development as a tourist attraction and a retirement village. 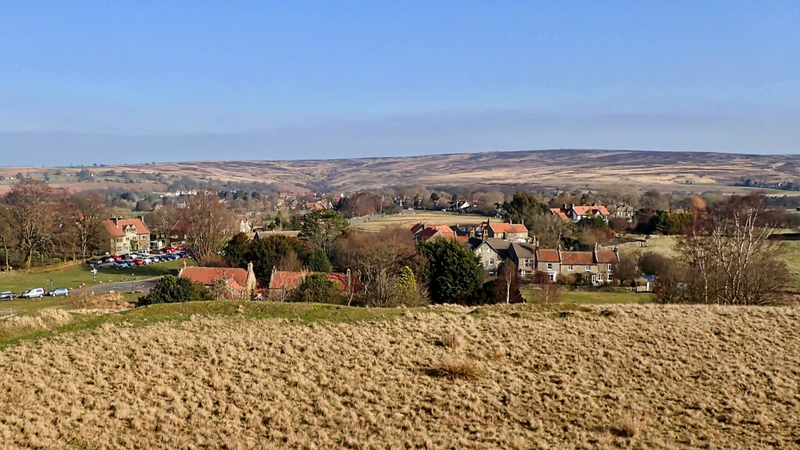 However, it is since Goathland was used as the setting for the fictional village Aidensfield in the TV series ‘Heartbeat’ that it has become perhaps the North York Moors worst honeypots. Certainly, a place to avoid on bank holidays but on a February morning there it is still a picturesque feel about it. Did you know, there was once a golf course in Goathland, on land pretty close to where you stood for the photo Mick.